We now offer FREE web links that can be customized to your business and your location that display nearby parking garages and reservable parking options. Reservable parking: Colonial Parking® offers the option to reserve parking in advance at over 80 locations. By reserving and pre-paying for a space through the custom web link, your guests are guaranteed a parking space when they arrive at the parking facility. This eliminates the need for driving in circles, desperately trying to find a space, and gives your guests parking peace of mind. Why do you need it? Parking in the city can cause major frustration and we understand that. 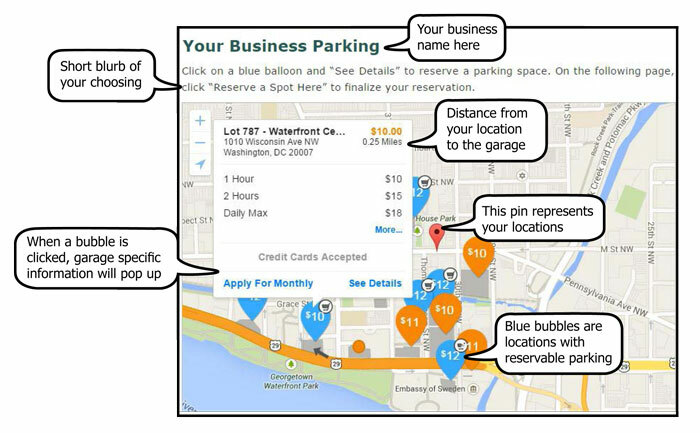 Having a custom parking web link to place on your website or in email communications helps to put your guests at ease. They know exactly where to go, what the cost will be and are given the option to reserve a guaranteed parking space. It’s EASY! It’s FAST! It gives your guests parking peace of mind. Please contact our Online Product & Marketing Manager, Allison Howard, to perform a full review of your parking needs and create a custom parking plan for your event or business. We look forward to working with you. 202-295-8290 or marketing@ecolonial.com .